CONCORD, N.C. – With four crashes this month during preparations for the Indianapolis 500, one which left James Hinchcliffe hospitalized in ICU, the question as to whether NASCAR should have a traveling medical team has once again come to the forefront. NASCAR has nurses who are familiar with the drivers and their medical records travel with its top three touring series. However, doctors from the community where the races are held staff the infield care centers. Whether NASCAR should have a traveling medical staff has been debated since the 1980s. It’s an issue that defending NASCAR champion Kevin Harvick said was discussed with the sanctioning body the second week of the season. 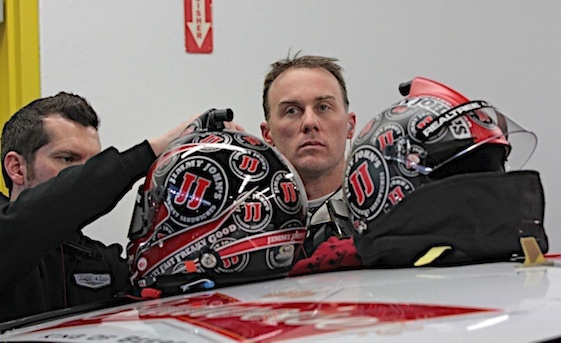 Harvick noted that some of the doctors had lengthy service at the various tracks. NASCAR six-time Sprint Cup champion Jimmie Johnson said he had sat in several discussions with NASCAR about why the current system is in place. “NASCAR is adamant that having true ER folks that every single day fight in an ER room to save people’s lives are the best people to have in place here on a weekend for us,” Johnson said. “In my heart, I feel like there is maybe a hybrid version where, yes, we have those EMTs here, but then we also have people that are very sharp and NASCAR specific, car specific, know the drivers and know our cockpits. Kyle Bush, who rode a motorized cart into the Charlotte Motor Speedway infield media center and passed out Skittles along the way, said Thursday he’s more concerned about winning a race than breaking into the top 30 in the NASCAR Sprint Cup point standings. Busch missed the season’s first 11 races due to injuries he suffered in the season opening Xfinity Series race at Daytona. NASCAR waved his absence from those races and said he could make the Chase if he won a race and was in the top 30 in the point standings. That’s the same requirement for all of the drivers who are victorious in the season’s first 26 races. Busch pointed to Dover, Watkins Glen, Indianapolis and Richmond as potential victory tracks. Jimmie Johnson said Thursday he was “very shocked” when his team received a warning for pulling out his Chevrolet’s side skirts during the final pit stop in last weekend’s Sprint All-Star race at Charlotte Motor Speedway.